After eight long years of protests and legal battles, India’s Ministry of Environment and Forests has rejected Vedanta Resources’ controversial plan to mine for Bauxite on the Dongria Kondh’s Sacred Mountain in Orissa, India. Environment minister Jairam Ramesh announced on August 24 that the proposal was being dropped was because the UK-based company and their partner, the state-owned Orissa Mining Corporation, has extensively violated state and federal laws including the Forest Conservation Act (FCA), the Forest Rights Act (FRA), the Environment Protection Act (EPA) and the Orissa Forest Act. “This is not an emotional decision. There is no prejudice and no politics. This is not because Niyamgiri is sacred. This is purely a legal approach,” said Ramesh. But even so, it is the rarest form of victory for a Minister to say ‘no’ a mining project, especially since the Indian Supreme Court and the government already said yes in 2008 and 2009, respectively. Perhaps these earlier decisions were simply uninformed impulses, where the Minster had access to an investigative report that detailed Vedanta’s extralegal activities and the possible negative impacts the project could have on biodiversity and the region’s Indigenous population. The report also found that “the legitimate claims of the Dongria Kondh have been discouraged and denied without the due process of law, which is illegal on part of the district or sub-divisional committees. The report further said that the Orissa government is not likely to implement FRA in a fair and impartial manner since it has gone to the extent of forwarding false certificates,” says Padmaparna Ghosh in an article for the Mint. 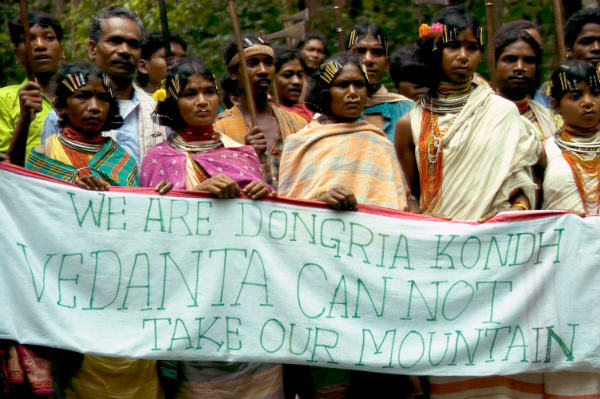 For the past eight years, the Dongria Kondh have maintained that Vedanta’s project would mean “death to the Dongria Kondh” and that they will do everything in their power to protect Niyamgiri Mountain, the would-be site of Vedanta’s bauxite mine. To the Dongria Kondh, Niyamgiri Mountain is home to their god, Niyam Raja. “The Niyamgiri mining denial is the result of a sustained and hard-fought struggle by the Dongria Kondhs, the Kutia Kondhs, and the Niyamgiri Suraksha Samiti, supported by many other people and groups in India and abroad. This is indeed a victory for the people’s movements on the ground and will inspire other struggles throughout the country,” says the National Forum of Forest People and Forest Workers (NFFPFW). “Nonetheless, it is premature to assume that the machinations of Vedanta Group will stop with the denial of mining in Niyamgiri. Vedanta’s illegal alumina refinery at Lanjigarh is still operative and, given the scores of violations it has evidently committed over the years, a decision to shut it down immediately must be taken and punitive measures be considered against the company and their cronies in the state government,” continues the NFFPFW. “There is a need to be vigilant against further possible transgressions by the company. Moreover, it would rather be brazen mockery of the recent government decision itself and a travesty of justice and democratic norms, if Vedanta is given some alternative sites to extract bauxite to feed the refinery, as the company has already started mobilizing on the corridors of power for the same. “It is also important to keep in mind that one denial and one piece of justice will not undo years of governmental kowtowing to corporate greed and innumerable narratives of injustice and illegalities unfolding everywhere in India. From Arunachal Pradesh to Jammu and Kashmir to Himachal Pradesh, and from Orissa to Maharashtra and Goa, forest communities, farmers, and fish-workers are still locked in grim battles against the corporate—State nexus in order to defend their social, economic, cultural, and ecological existence—in essence, their identity.